This special offer is a great deal for DCC RPG fans! 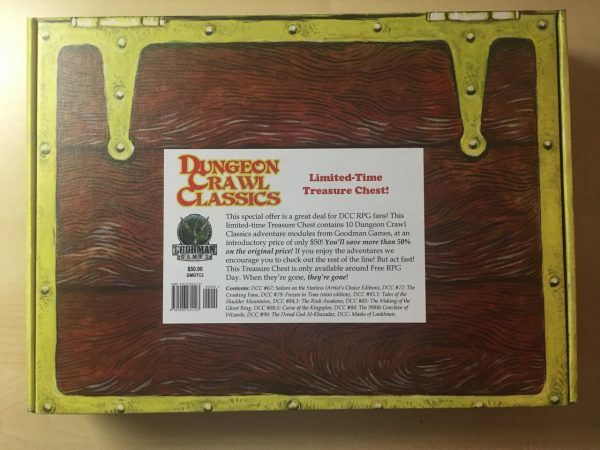 This limited-time Treasure Chest contains 10 Dungeon Crawl Classics adventure modules from Goodman Games. You�ll save more than 50% on the original price! If you enjoy the adventures check out the rest of the line! But act fast! This Treasure Chest is only available for a limited time When they�re gone, they�re gone! DCC #075: The Sea Queen Escapes!